CAMBRIDGE, MASS.–When an earthquake strikes, nearby seismometers pick up its vibrations in the form of seismic waves. In addition to revealing the epicenter of a quake, seismic waves can give scientists a way to map the interior structures of the Earth, much like a CT scan images the body. By measuring the velocity at which seismic waves travel at various depths, scientists can determine the types of rocks and other materials that lie beneath the Earth's surface. The accuracy of such seismic maps depends on scientists' understanding of how various materials affect seismic waves' speeds. Now researchers at MIT and the Australian National University have found that seismic waves are essentially blind to a very common substance found throughout the Earth's interior: water. Their findings, published today in the journal Nature, go against a general assumption that seismic imaging can pick up signs of water deep within the Earth's upper mantle. In fact, the team found that even trace amounts of water have no effect on the speed at which seismic waves travel. The results may help scientists reinterpret seismic maps of the Earth's interior. 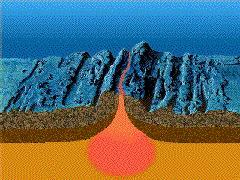 For instance, in places such as midocean ridges, magma from deep within the Earth erupts through massive cracks in the seafloor, spreading away from the ridge and eventually solidifying as new oceanic crust. The process of melting at tens of kilometers below the surface removes tiny amounts of water that are found in rocks at greater depth. Scientists have thought that seismic images showed this "wet-dry" transition, corresponding to the transition from rigid tectonic plates to deformable mantle beneath. However, the team's findings suggest that seismic imaging may be picking up signs of not water, but rather, melt – tiny pockets of molten rock. "If we see very strong variations [in seismic velocities], it's more likely that they're due to melt," says Ulrich Faul, a research scientist in MIT's Department of Earth, Atmospheric, and Planetary Sciences. "Water, based on these experiments, is no longer a major player in that sense. This will shift how we interpret images of the interior of the Earth." Faul's co-authors are lead author Christopher Cline, along with Emmanuel David, Andrew Berry, and Ian Jackson, of the Australian National University. Faul, Cline, and their colleagues originally set out to determine exactly how water affects seismic wave speeds. They assumed, as most researchers have, that seismic imaging can "see" water, in the form of hydroxyl groups within individual mineral grains in rocks, and as molecular-scale pockets of water trapped between these grains. Water, even in tiny amounts, has been known to weaken rocks deep in the Earth's interior. "It was known that water has a strong effect in very small quantities on the properties of rocks," Faul says. "From there, the inference was that water also affects seismic wave speeds substantially." To measure the extent to which water affects seismic wave speeds, the team produced different samples of olivine – a mineral that constitutes the majority of Earth's upper mantle and determines its properties. They trapped various amounts of water within each sample, and then placed the samples one at a time in a machine engineered to slowly twist a rock, similar to twisting a rubber band. The experiments were done in a furnace at high pressures and temperatures, in order to simulate conditions deep within the Earth. "We twist the sample at one end and measure the magnitude and time delay of the resulting strain at the other end," Faul says. "This simulates propagation of seismic waves through the Earth. The magnitude of this strain is similar to the width of a thin human hair – not very easy to measure at a pressure of 2,000 times atmospheric pressure and a temperature that approaches the melting temperature of steel." The team expected to find a correlation between the amount of water in a given sample and the speed at which seismic waves would propagate through that sample. When the initial samples did not show the anticipated behavior, the researchers modified the composition and measured again, but they kept getting the same negative result. Eventually it became inescapable that the original hypothesis was incorrect. "From our [twisting] measurements, the rocks behaved as if they were dry, even though we could clearly analyze the water in there," Faul says. "At that point, we knew water makes no difference." Another unexpected outcome of the experiments was that seismic wave velocity appeared to depend on a rock's oxidation state. All rocks on Earth contain certain amounts of iron, at various states of oxidation, just as metallic iron on a car can rust when exposed to a certain amount of oxygen. The researchers found, almost unintentionally, that the oxidation of iron in olivine affects the way seismic waves travel through the rock. Cline and Faul came to this conclusion after having to reconfigure their experimental setup. To carry out their experiments, the team typically encases each rock sample in a cylinder made from nickel and iron. However, in measuring each sample's water content in this cylinder, they found that hydrogen atoms in water tended to escape out of the rock, through the metal casing. To contain hydrogen, they switched their casing to one made from platinum. To their surprise they found that the type of metal surrounding the samples affected their seismic properties. Separate experiments showed that what in fact changed was the amount of Fe3+ in olivine. Normally the oxidation state of iron in olivine is 2+. As it turns out, the presence of Fe3+ produces imperfections which affect seismic wave speeds. Faul says that the group's findings suggest that seismic waves may be used to map levels of oxidation, such as at subduction zones – regions in the Earth where oceanic plates sink down into the mantle. Based on their results, however, seismic imaging cannot be used to image the distribution of water in the Earth's interior. What some scientists interpreted as water may in fact be melt – an insight that may change our understanding of how the Earth shifts its tectonic plates over time. "An underlying question is what lubricates tectonic plates on Earth," Faul says. "Our work points toward the importance of small amounts of melt at the base of tectonic plates, rather than a wet mantle beneath dry plates. Overall these results may help to illuminate volatile cycling between the interior and the surface of the Earth."